In the past few months, I've reviewed a number of titles in the Quilts of Love series. These books are all quite different -- different authors, different genres, different times -- but they all involve quilts, and they all involve love. They also are all fairly easy reads. The most recent one, A Sky without Stars by Linda S. Clare, took me on a journey to Arizona in the 50s. Quilting within the Lakota and Navajo cultures is not something I've ever really thought about. In 1951, Frankie Chasing Bear is a Lakota caught between cultures. She wants to raise her son Harold to revere his Lakota heritage, but she knows he will need to become as a white man to succeed. After his father's killed in a barroom brawl, Harold and Frankie move to Arizona, where she begins a Lakota Star pattern quilt for Harold with tribal wisdom sung, sewn and prayed into it. My thoughts: The story drew me in, with its start on a reservation in South Dakota -- a place we've prayed for, and played a tiny part in, with groups sending clothing, books, etc. along with people to love on the people there. That part was a little strange, thinking about people I know being the representatives of the "White Man's God" that Frankie struggle with. The action quickly moves to Arizona, though Pine Ridge comes up throughout the story. What I found particularly compelling about the book was Nick. He has struggled with alcoholism in the past, and a failed marriage, and he feels like an outsider in two worlds -- a half-breed who doesn't truly fit with the Indians he is trying to help, nor with the White Man's ways either. He's been sober for a decade or so, yet he struggles still with the call of the bottle. I'm not an alcoholic, so I won't swear that Clare "nailed it" in her descriptions of his struggles, but it sure felt realistic to me. That whole fight to not do what you know full well you should not do. And rational you finds it completely crazy that you are pulled to something you know is bad for you. Yet that fight to do the right thing, the healthy thing, still rages. This book doesn't make my 'favorite ever' list, but it was a fascinating glimpse into a culture not often represented in historical fiction. 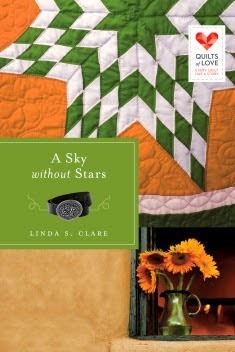 Don't miss this month's Quilts of Love book, A Sky Without Stars, by Linda S. Clare. Linda is celebrating the release with a Kindle HDX giveaway and joining her fellow Quilts of Love authors, Barbara Cameron and Joyce Magnin, for a Facebook "Spring Fling" party on April 1st.